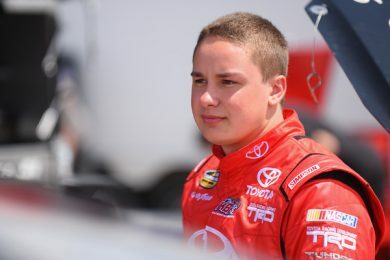 Christopher Bell will spend a substantial amount of time on asphalt in 2016 as he chases down a NASCAR Camping World Truck Series championship for Kyle Busch Motorsports. So it’s little wonder that the Norman, Oklahoma native is already chomping at the bit to go sling some clay on March 10-12, as he defends his Short Track Nationals title atop the quarter-mile I-30 Speedway clay oval. With last October’s event falling victim to rain, Bell still reigns as defending champion with the 28th Annual COMP Cams Short Track Nationals presented by Hoosier Tires rapidly approaching. “I’m looking forward to it, Short Track Nationals is always a lot of fun,” said Bell, who is set for his first full NCWTS campaign after picking off a win in one of his initial series starts last year at Eldora Speedway. With a $15,000 winner’s share up for grabs and $2,000 just to start the March 12 STN finale, Bell tries to make it two in a row after capturing the 2014 edition. Bell’s 2014 triumph followed a pair of STN runner-up finishes the previous two years to give the 21-year-old an unrivaled STN average finish. Bell will try to become just the fourth driver to go back-to-back in STN history. Steve Kinser topped the initial two events in 1988 and 1989, Gary Wright went back-to-back in 2003 and 2004 and most recently Tony Bruce, Jr., reeled off consecutive wins in 2007 and 2008. With the entry forms released last week, entries are already beginning to flow into the I-30 Speedway track office. Entry forms are available here, and are just $150 if postmarked by March 4. Any entries after that will cost $250. March’s STN makeup will be the first of two Short Track Nationals events at I-30 Speedway in 2016, with the regularly scheduled 29th edition set for November 2-5. This March’s edition will feature two full qualifying nights of action on Thursday and Friday preceded by an open practice session on Wednesday night. The top three from the Thursday and Friday features will lock into the $15,000-to-win, $2,000-to-start STN finale. The original attempt at the 28th Short Track Nationals in October was reduced from four nights to just one due to inclement weather. That card on the final Thursday of October did more than live up to billing though, with Aaron Reutzel rallying from seven rows deep to make a late move on the high side around Jac Haudenschild for the win. Reutzel and Haudenschild earned provisional starting positions in the March 12 STN finale by virtue of finishing first and second. Bell became the 17th different winner of the event in October of 2014 and youngest thus far on a star-studded list that includes Sammy Swindell, Paul McMahan, Brad Sweet, Bruce, Jason Meyers, Jason Johnson, Tim Montgomery, Wright, Jason Sides, Mike Ward, Tim Crawley, Wayne Johnson, Pete Butler, Terry Gray, John Gerloff and Kinser.